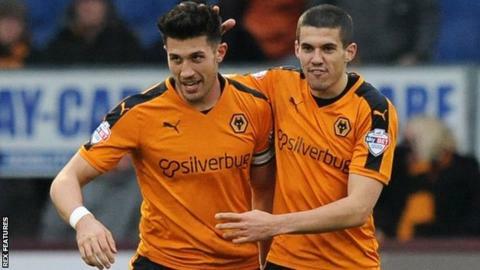 Wolves captain Danny Batth headed a stoppage-time equaliser at Turf Moor to deny Championship leaders Burnley a seventh successive league win. Sam Vokes looked to have scored the winning goal against his former club before Batth's intervention from Nathan Byrne's corner earned a deserved point. The hosts had failed to register a shot on target until Wales striker Vokes headed in Joey Barton's cross. His goal came after Jack Price struck the post for Wolves from 30 yards. Burnley remain four points clear at the top of the table, with Brighton leapfrogging Middlesbrough into second place with a 2-1 win at MK Dons. Defeat would have been harsh on Wolves, who have lost only one of their past five games and remain 12th in the table. George Saville had a shot blocked by Clarets defender Ben Mee during a goalless first half, while both Jed Wallace and Conor Coady went close for the visitors before Vokes' 13th league goal of the season put Burnley ahead. Ten of those goals have come since 12 January, with Vokes and strike partner Andre Gray contributing 33 between them for Burnley in the Championship this term. Burnley boss Sean Dyche: "People need to remember that despite our position, nobody comes here just to lay down and roll over. "Nothing ever comes easy for us here or when we're playing away from home. "We're still clear at the top and we're still on a long unbeaten run. As long as we don't put too much pressure on ourselves then we'll continue to be OK.
"There's pressure everywhere in football, but we're not feeling any here." Wolves head coach Kenny Jackett: "Burnley are a really good side and they started well in the opening 10 or 15 minutes, but we rode it through and were right in the game at half-time. "I suppose at the end of it you've got to decide whether it's a glass half-full result or a glass half-empty. "It's definitely the first one for me because there were a lot of good performances out there. "We had chances here, and we didn't take them. That has to be better and it's something we will be working on during the week." Match ends, Burnley 1, Wolverhampton Wanderers 1. Second Half ends, Burnley 1, Wolverhampton Wanderers 1. Goal! Burnley 1, Wolverhampton Wanderers 1. Danny Batth (Wolverhampton Wanderers) header from the centre of the box to the centre of the goal. Assisted by Nathan Byrne with a cross following a corner. Corner, Wolverhampton Wanderers. Conceded by Michael Keane. Attempt missed. Scott Arfield (Burnley) right footed shot from outside the box is high and wide to the right. Assisted by Rouwen Hennings with a headed pass. Foul by Björn Sigurdarson (Wolverhampton Wanderers). Substitution, Burnley. Rouwen Hennings replaces Andre Gray. Substitution, Wolverhampton Wanderers. Nathan Byrne replaces Jed Wallace because of an injury. Delay in match Jed Wallace (Wolverhampton Wanderers) because of an injury. Attempt missed. George Saville (Wolverhampton Wanderers) left footed shot from outside the box misses to the right. Assisted by Jed Wallace. Offside, Burnley. Ben Mee tries a through ball, but Scott Arfield is caught offside. Ben Mee (Burnley) is shown the yellow card for a bad foul. Foul by Ben Mee (Burnley). Dominic Iorfa (Wolverhampton Wanderers) wins a free kick in the attacking half. Substitution, Wolverhampton Wanderers. Joe Mason replaces Michal Zyro. Substitution, Wolverhampton Wanderers. Björn Sigurdarson replaces Jeremy Helan. Joey Barton (Burnley) wins a free kick in the attacking half. Foul by Michal Zyro (Wolverhampton Wanderers). Attempt blocked. Scott Arfield (Burnley) right footed shot from outside the box is blocked. Goal! Burnley 1, Wolverhampton Wanderers 0. Sam Vokes (Burnley) header from the centre of the box to the bottom left corner. Assisted by Joey Barton with a cross. Attempt saved. George Saville (Wolverhampton Wanderers) left footed shot from the centre of the box is saved in the bottom left corner. Assisted by Jeremy Helan. Attempt missed. Michal Zyro (Wolverhampton Wanderers) header from the centre of the box is high and wide to the right. Assisted by Jed Wallace with a cross. Attempt blocked. Stephen Ward (Burnley) right footed shot from outside the box is blocked. Assisted by David Jones. Attempt missed. George Boyd (Burnley) left footed shot from the right side of the box is close, but misses the top left corner. Corner, Burnley. Conceded by Matt Doherty. George Saville (Wolverhampton Wanderers) is shown the yellow card for a bad foul. Joey Barton (Burnley) wins a free kick on the right wing. Foul by George Saville (Wolverhampton Wanderers). Attempt missed. Conor Coady (Wolverhampton Wanderers) right footed shot from outside the box is high and wide to the right following a set piece situation. Attempt blocked. Jed Wallace (Wolverhampton Wanderers) left footed shot from outside the box is blocked. Attempt blocked. Jed Wallace (Wolverhampton Wanderers) right footed shot from outside the box is blocked. Foul by Andre Gray (Burnley). Matt Doherty (Wolverhampton Wanderers) wins a free kick in the attacking half. Corner, Wolverhampton Wanderers. Conceded by David Jones. Attempt blocked. Jeremy Helan (Wolverhampton Wanderers) left footed shot from the left side of the box is blocked. Jack Price (Wolverhampton Wanderers) hits the left post with a right footed shot from outside the box. Assisted by George Saville. Attempt missed. Jeremy Helan (Wolverhampton Wanderers) left footed shot from the left side of the box misses to the right. Assisted by Michal Zyro with a headed pass. Offside, Wolverhampton Wanderers. Jack Price tries a through ball, but Michal Zyro is caught offside.